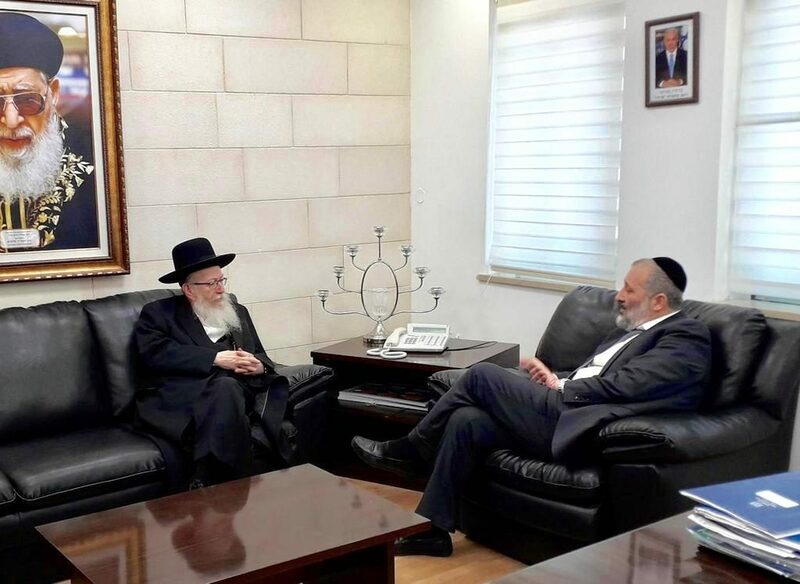 Shas chairman Rabbi Aryeh Deri talking with United Torah Judaism MK Rabbi Yaakov Litzman in Deri’s office, Thursday. Earlier this week, Maariv quoted anonymous sources in UTJ, whom they claimed had approached Gantz and presented the possibility that they would join a coalition led by him, at least for the period that he was prime minister. According to the agreement that formed Blue and White, joining the Resilience Party and Yesh Atid, Gantz and Yesh Atid chairman Yair Lapid will split the five-year term of the next government, with Gantz serving as prime minister for two and half years, followed by Lapid. A coalition with Lapid as prime minister, who is seen as fiercely anti-chareidi, was ruled out by the sources, the report said. The report said that the sources in UTJ reaching out to Gantz were from the party’s Degel HaTorah faction, which is seen as more amenable to Blue and White’s likely willingness to withdraw from parts of Yehudah and Shomron to encourage the Palestinian Authority to enter into negotiations with Israel, Maariv claimed. But the statement by Rabbi Deri and Rabbi Litzman Thursday dispels that myth. “We will not conduct negotiations with any government that includes Yair Lapid, in any situation,” including a scenario where he is not prime minister, the statement said. The statement also outlines cooperation between UTJ and Shas in the election campaign. “We will work together in a fair and cooperative manner to ensure the success of both sides, and to increase the overall representation of chareidi parties in the next Knesset,” the statement added.